Eldest son of Robert Heath married 1st in 1881 Euphemia Celine (d.1921) daughter of P.G. Vanderbyl of Cape Town and High Beeches Farnborough; 3 more marriages followed. Created Bart in 1904. He was an ironmaster and colliery proprietor, and a Col. in the Staffs Yeomanry Cavalry. Voltelin Percy (1889-1914) his only son, a Lieut. in the Royal Horse Guards, was killed in action. 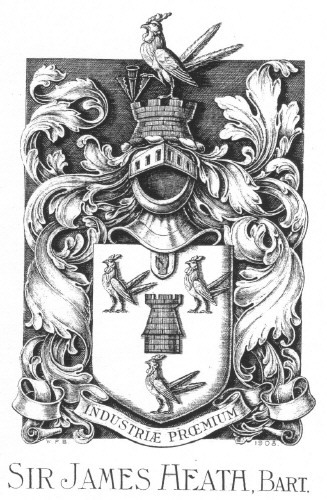 The copper plate of 1908 was altered to show the son's name, though the Ulster hand was retained. Sir James Heath was born 26th January 1852 and died on 24th December 1942. His parents were Robert Heath and Anne Beech. It was this Robert heath who established the coal and iron empire at Biddulph and bought the Grange in 1872. James was their 4th child. He went to Clifton College where he played cricket and football for the College. In 1873 he became a partner in family firm.He travelled around the world for company twice. On his travels he visited Burma, Java, China, South Africa, Australia , New Zealand, the U.S. and Canada.. He served in India in 1876 and again in 1873. He raised a 300-400 Imperial Yeomen for the Boer War and was their Commanding Officer from 1898-1902. He also served in the North Staffordshire Yeomanry for 29 years and became their Colonel in Chief. With his brothers, he built a convalescence home at Llanfairchan in Wales. he was on the Wolstanton School Board for 15 years. he was also J.P. for Stafford and Deputy Lieutenant for Staffordshire and N.W. Staffordshire from 1892-1906. Served on several councils. On 15th December, 1904 he was created a baron. He married Euphemia Celina Van-der-Bel of Cape Town and Farnborough on the 12th July 1881. They had two children. One was Voltelin Percy Heath and Hylda Madeleine who married twice: the second time to Cecil Robert Bates, the builder of the Cunard and White Star shipping lines.